When Brendan decided he would get out of the hustle and bustle of Kuala Lumpur he found that the Batu caves to be just the sanctuary of peace and quiet he was after. My partner and I recently travelled throughout Malaysia and Singapore for a number of weeks. Besides undertaking the usual tourist activities such as the Petronas Towers, market shopping, Universal studios and Marina Bay Sands, we decided that we needed to take part in a cultural activity and that we would attend the Batu Caves on the outskirts of Kuala Lumpur. 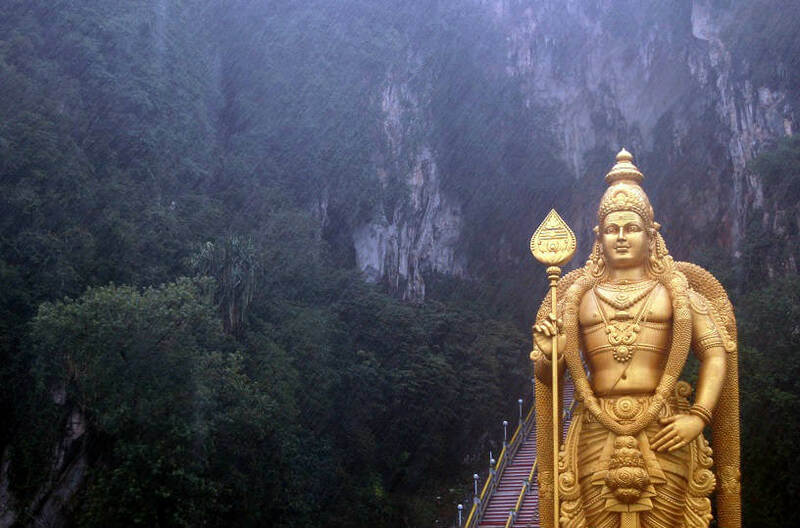 The Batu Caves consists of a limestone hill which contains a series of caves and cave temples. The cave is a Hindu shrine, dedicated to Lord Murugan. The limestone forming Batu Caves is said to be around 400 million years old, while thee temple is said to be founded in 1890. The biggest cave, is referred to as Cathedral Cave or Temple Cave, has a 100 meter high ceiling, which can only be accessed by climbing 272 steps. Now these were not your average steps, they were some of the steepest steps I have ever encountered. There were a number of factors we had to deal with while climbing these stairs; the first being the weather. The day we decided to do the climb was a 38°C, 89% humidity day. Coming down the stairs were flocks of birds and bats (I have to say that winged animals are a great fear of mine), and jumping from the trees along the sides of the stairs were monkeys. The further we made it up the stairs the more our legs began to burn and the hotter it got. We ended up having to pick certain areas along the stairs where we could rest. As we finally made it to the top of the stairs it was not only an achievement in itself, but to turn around and look behind you at the view of the surrounding areas was just magical. Once you reach the top of the stairs you can immediately begin to smell incense and the chant of Hindu prayers. As you walk down into the entrance of the cave the limestone walls tower overhead and at the very top there is a small hole where light is filtered into the cave. As you get deeper into the cave, carvings of Lord Murugan and different prayer versus have been inscribed into the limestone. Some of the carvings have been on the walls for of this cave for hundreds of years. As you reach the end of the cave there is a shrine to the many Hindu deities, where thousands sticks and cones of incense is burning and many Hindu practising people wearing traditional dress praying. The noise of their prayers echo off the walls and the thought of how many years people have being partaking in this process is truly astounding. Many hours can be sent watching the prayers or exploring the caves. After having done a small amount of exploration we decided to begin our descent back down to the ground. However on the descent don't be fooled by thinking it will be easier than going up. Going down the stairs presents its own set of challenges besides the animals and the weather. Due to the stairs being so narrow it is hard to fit your whole foot on each stair therefore if you over step you will slip, and if you slip it is a long way down to the bottom. After making it to the bottom in one piece we decided to take a break at one of the market stalls and enjoy a nice cool drink of coconut juice, directly out of the coconut. Looking back at the stairs it was quite amazing to think we had just made it to the top and back again. The whole holiday was very relaxing and beautiful weather. We have now begun planning our next holiday to the island regions of Malaysia.